Practise Vowel Game Card Pairs, cut out, with directions saved. 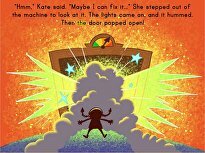 Students will distinguish short from long vowel sounds in a game show format. Announce that today long vowels are here to appear in a game show called Will the Real Long Vowel Please Stand Up?Explain that short vowels will try to fool us into believing they are the RealLong vowel words. 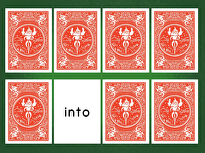 Introduce the Long Vowel Picture Card words from the set displayed on the board. Erase the e on the word ate. Erase the macron mark and replace it with a breve mark, ă. Explain that we use the breve to show short vowels. Point out that sometimes it’s hard to figure out which vowel is short and which vowel is long. Sometimes the silent e will help us, like in the word ate. Point to each Long Vowel Picture Card and ask students to echo-read each card as you say it. 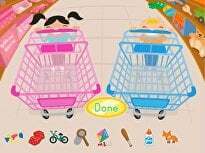 These pictures will help the students decide what game cards are long or short. Read the key words, the Vowel Picture Card Words. Ask students to stand after each word is read. 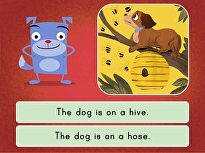 Introduce the Will the Real Long Vowel Please Stand Up?Game by playing a practise round. 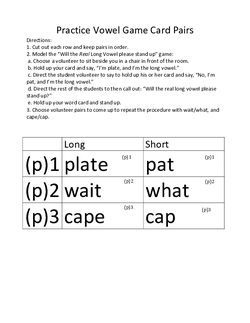 Follow the directions on the practise Vowel Game Card Pairs worksheet. Review the practise game. 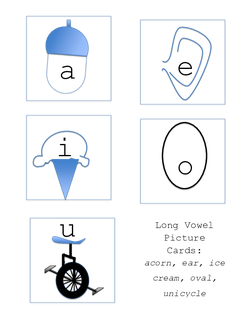 If errors were made, refer to the Long Vowel Picture Cards to sound out the vowel in each mistaken word. Play the game. 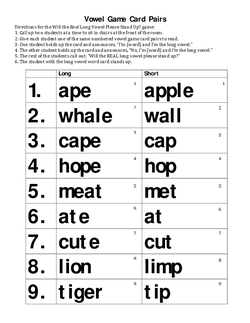 Follow the directions on the Vowel Game Card Pairs worksheet. 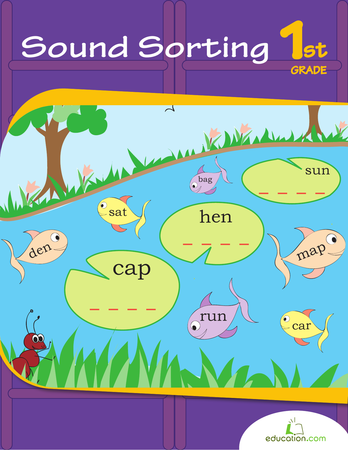 If mistakes are made, refer to the Long Vowel Picture Cards to reteach sounds. 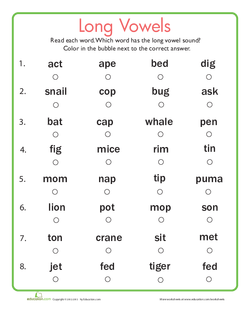 Distribute the Long Vowels quiz and read the directions aloud. Rotate around the room to monitor understanding as students complete the quiz. Enrichment:Challenge students to create additional long vowel picture cards. Students can also write rhyming long vowel sentences. For example: The crate was a great place for a pet. 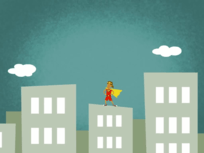 Support: Distribute less challenging word cards to struggling readers. 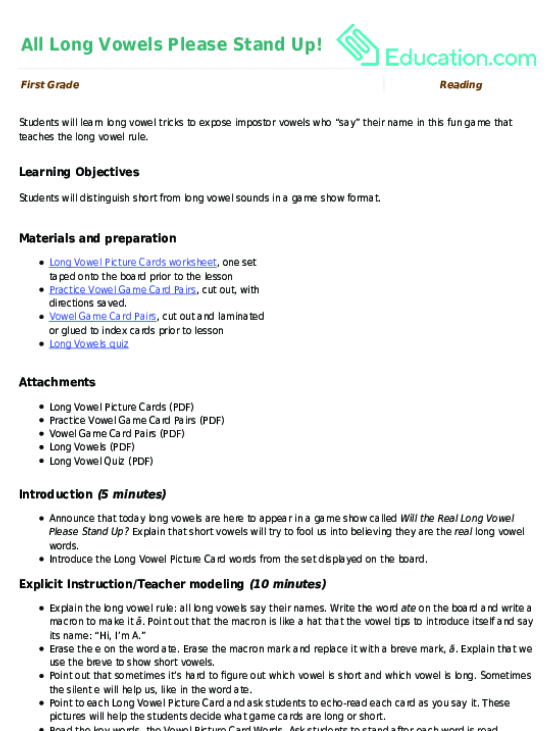 Make extra copies of the Long Vowel Picture Cards and allow students to use it during the game. 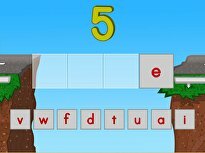 Reduce the number of Long Vowel quiz items required from eight to four and select less challenging word choices for students who struggle. Use quiz words to review and check for correct responses by having student volunteers read each word of a chosen quiz item aloud. The other students stand when a long vowel is heard. Collect quizzes for a percentage grade for your grade book. Read the Long Vowel Picture Cards as a class. Ask students to share with a partner one new short vowel word learned today.